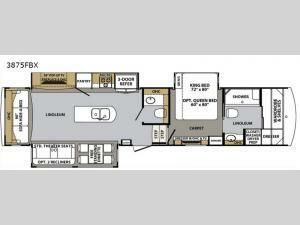 Camping in luxury can be fun and easy with this 3875FBX Cardinal Luxury fifth wheel by Forest River. Almost straight in from the entry door there is a convenient half bathroom and through the front private bedroom is the other bathroom with a shower, a wardrobe with shelves, a dresser, and even a closet that is prepped for the optional washer/dryer to be added. Meal prep is made easy because of the kitchen island with a double sink, a large pantry, and a stainless steel residential refrigerator. There is a 90" hide-a-bed sofa where you can sit and relax during the day, and at night you can turn it into an extra sleeping space. When you are ready to turn in for the night then head up the stairs to the bedroom where you will find a comfortable king-size bed with a Denver mattress. In any Cardinal Luxury fifth wheel you will find comfort and conveniences both inside and out as these units were built with your enjoyment in mind. Each unit features an all welded aluminum super structure frame and includes an Alpha Super Flex II TPO roof. Each Cardinal Luxury model also has a wide body construction along with three to five slides to provide you with maximum space inside for 100% enjoyment with your family and friends. You will love the cathedral ceilings for added interior height, plenty of closets to keep all of your clothing, and beautiful Shaw lino throughout. You will also appreciate the at-home touches inside that give each unit a luxurious feel like the crown molding ceiling and cabinet trim, an electric fireplace, and pendant lighting in the kitchen area. The outside of each coach also has a high end look with its premium high-gloss gel coat fiberglass that you have the option of choosing in one of four full body paint color schemes!